Welcome to Fish Window Cleaning! We are your local window cleaning professionals serving homes and businesses in Bloomington, Bedford, and Martinsville, IN! 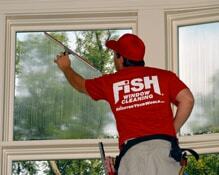 Fish Window Cleaning can make all of the windows in your home sparkle all year long! Window cleaning is a time consuming task and we feel you shouldn't have to spend your free time cleaning! Let us check window cleaning and a few other chores off your to-do list. You can trust our team of bonded and insured professionals to take the utmost care of your home as we clean. We are careful and respectful of your belongings and leave your home looking exactly the way it did before we arrived - except for your now sparkling windows! We are committed to your satisfaction. We'll even walk through your home with you and make sure you're satisfied with our work before we leave. If something isn't right, we'll make it right! We know that as a business owner, your time is important. You have more important tasks than always making sure your windows do not have fingerprints and smudges. Let Fish Window Cleaning worry about those things for you! We can maintain the appearance of your business all year long, helping you give your customers a great first impression. You can trust a member of our team to help customize a cleaning program that will work best for your needs, budget, and schedule. Why choose FISH to maintain the appearance of your business?